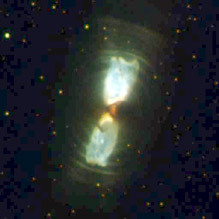 The Egg Nebula: Prototype of a proto-planetary nebula as seen from Hubble Space Telescope. For many deep sky observers planetary nebulae are among the most attractive objects on the night sky. No other type of object has such a large variety of shapes and structures which are observable in detail with amateur telescopes! But how and why does these complex shapes form? 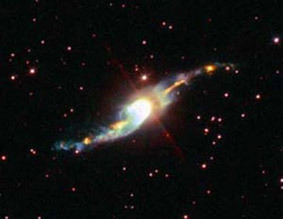 To answer this question we need to take a look on the evolution to planetary nebulae. We consider stars with less then about 8 solar masses. They blow up themselves to a red giant at the end of their life time. They are now in the asymptotic giant branch in the upper right of the Hertzsprung-Russel diagram. In the beginning they blow away their shell in an intense stellar wind (~10 km/s) followed by a shorter phase of an even more intense and faster superwind (~20 km/s) . The annual mass loss is around 10-7 to about 10-4 solar masses . At this point the development of two different types is possible. The first is called "SOLE" (Star Obvious Low-level Elongated) and is characterized by a homogenous symmetric stellar wind. The wind creates a homogenous, spherical shell which leads to ring nebulae. The superwind is more intense along the equatorial plane producing an ellipsoidal shape. The second type called "DUPLEX" (DUst-Prominent Longitudinally-Extended) has a much more intense equatorial wind. The additional material from the wind creates an optically thick torus of dust around the central star. 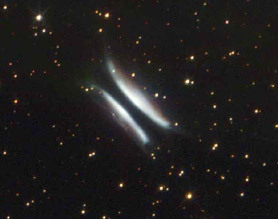 Perpendicular to the ring two optically thin lobes are created making a bipolar DUPLEX nebula. A near companion of the AGB star can be a reason for the equatorially enhenced wind. A different interpretation of the different appearances of planetary nebulae is given in . It says nearly every PN has a bipolar shape and the appearance only changes with the orientation towards us. Finally these stars enter the stage as proto-planetary nebula or post-AGB star. The central star illuminates the repelled shell, the light is being reflected to us. Thus proto planetaries are reflection nebulae. In this stage a very fast post-AGB wind evolves with velocities of several 100 km/s. This may pass the slower AGB-winds and collide with them which can result in shock ionisation. But the degree of excitation is pretty low and the continuous spectrum still dominate. Photo ionisation needs surface temperatures of about 30,000 K. Central stars of PPNe have temperatures in between 4,000 and 30,000 K, a luminosity of about 104 suns and their spectrum is comparable to type F to G super giants. The post-AGB stage takes about 1,000 years. Only about 100 PPNe are know today. That corresponds quite well with the 1,500 known planetary nebulae with a life time of about 10,000 years. The surface of the star gets hotter when it has blown away its complete shell. It finally gets hot enough to photo-ionise the shell and let it shine. A planetary nebula has evolved from the proto-planetary. A very nice review of this metamorphosis is given in . The cornerstone for the research on PPNe has been laid in the years 1971 to 1974. In this years the sky has been surveyed with telescopes aboard nine rockets of the Air Force Geophysical Laboratory (AFGL) at a wavelength of 11 µm. Almost all PPNe covered in this project has been first recognized in this survey. The visual and photographic observation of these objects is a bit problematic. Observations of SOLE type nebulae are almost impossible because of the central giant star which outshines the faint reflection nebula. The brightness ratios between central star and nebula are several thousand to one which even pushes the Hubble Space Telescope to its limits ! 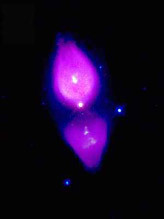 So we have to place our focus on the DUPLEX nebulae where the central star lies behind the equatorial dust torus. Unfortunately most PPNe have a very red spectrum, most of the reflected light lies in a spectral range where the human eye is practically insensitive at night. 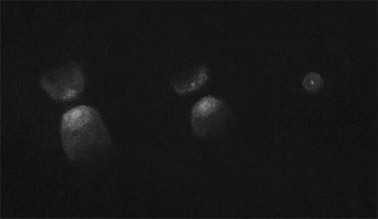 Furthermore the objects are reflection nebulae. Interference filters which might be of great use on planetary nebulae does not work here. However the observation of proto planetary nebulae is not hopeless. The best known and first discovered PPN is the Egg Nebula in the constellation of Cygnus. It has its name from its appearance on low resolution photographs . 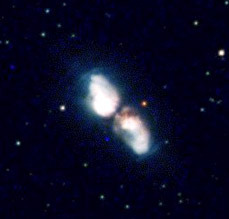 It was first cataloged by Fritz Zwicky as IV Zw 67 in his 4th list of compact galaxies as "Pair of blue fuzzy oval compacts". Later the galactic origin of this object has been recognized and intense research began on this object which is now accepted as the prototype of a proto-planetary nebula. The northern half is brighter by about 2mag and also about 40 percent larger than the southern. The spectrum resembles that of a F5 super giant star. Its distance is adopted as 1 kpc . An interesting feature is the equatorial ring, which is formed by the emission of molecular hydrogen H2. Regrettably this is only visible in infrared wavelengths. Very characteristic are the four searchlight structures, very apparent on the Hubble exposures, which cross in the center of the nebula. They are created by a pair of holes in the polar region of the dust shell surrounding the central star . Concentric rings which are most evident near the searchlight structures tell us about the past of the nebula which has undergone periodical changes of the intensity of the stellar wind. The period must have been around 470-650 years. 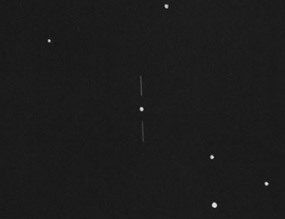 The object brightened continuously from 15m2 to 13m2 between 1920 and 1958. But now the brightness seems to be more or less constant . When I first observed the object I was surprised by the brightness which I assumed as around 12mag! Furthermore it is large enough to let some of its structure be visible to visual observers. Why aren't there many more observations of this interesting object? Perhaps some are deterred by the obscurity of this object. In the Night Sky Observer's Guide it is described as a very difficult object which is completely wrong! In a 10" telescope it shows up as a bright but pretty small nebula. At higher magnifications its bipolar structure is clearly visible. It consist of two parabola shaped halves, the northern is clearly brighter, and both have a brightness peak in the middle. Between them runs a distinct dark lane. Every time reflection takes place polarization of the light may come into play. The light is being scattered at the particles in the nebula and the photons oscillate parallel to each other. In rare cases the light of an object is polarized by more then 5 percent, the light of the Egg Nebula is polarized by about 50 percent and this effect is visible with amateur telescopes! Necessary is only a polarizing filter which is used by many amateur astronomers to reduce the glare of the moonlight or which can be found in the photo equipment. If you hold the filter between the eyepiece and the eye and rotate it you can see the nebula fading and brightening. If you rotate the filter so that the nebula is damped most the nebula vanishes nearly completely. If you rotate the filter again by 90� the nebula is nearly as bright as without filter! This is astrophysics live! The effect is most prominent in telescopes of 8" to 12" aperture. In larger telescopes the nebula is still very bright at minimum transmission so the change light of light is not so obvious. 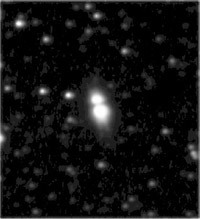 Right: CCD exposure of the Egg Nebula, Wilfried Wacker, 16" Newton at f/4,5, WATEC camera, 50 x 10 Sec., the field of view is ca. 3' x 3'. A second well known PPN is M 1-92 or the Footprint Nebula, situated also in Cygnus. A good introduction to this object can be found in . The nebula has a distance of about 2.5 kpc and a luminosity of about 104 suns. The central star has a temperature of 20000 K and thus well on the way to become the source for a planetary nebula. The object has some zones of line emission. In the visual range of the spectrum this is manly Hα, but there is also some few [OIII] emission. In this case it is due to shock emission. The post-AGB wind collides with a velocity of about 200 km/s with the expelled shells of the star, heats them up and excites them to radiate light. 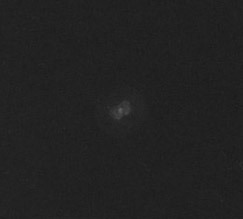 M 1-92 has an appearance which resembles that of the egg nebula very much: a pretty high brightness, it is often said to be around 11 mag, but only a tiny size of 11.5" by 4.5". High magnifications from 300 times and up and good seeing are necessary to detect the bipolar structure. In a 10 inch at 417x the northwest component appears slightly elongated. The much fainter second part can be seen with difficulty as a stellar object. I could not observe any response to the polarizing filter. That astronomers do have plenty of fantasy can be seen in our next objects. Like almost all closely examined PPNs this one has a nickname: Frosty Leo. In 1987 first research was done on this object and its nature as PPN was recognized. It is again a bipolar nebula which is seen nearly edge on. It is possibly the larges PPN in the sky with an apparent size of 27". It lies in a distance of about 3 kpc . Using adaptive optics a companion of the central star was found in a distance of 0.18". It is now believed to be the reason for the bipolar shape . Its anomalous spectrum could be explained with 50-65 K cool water grains. Thus it was named the Frosty Leo, Leo as it lies in the constellation Leo. 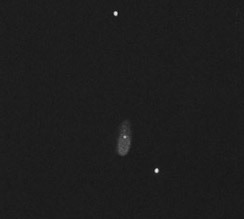 The observation of the Frosty Leo is similarly easy and rewarding as of the Egg Nebula. It has a central bright part in the shape of an eight with a central peak in brightness. The central star is not visible, at least in the visual part of the spectrum. The central part is surrounded by a fainter halo about twice in size of the central part. I estimate the overall brightness to be around 11 mag. 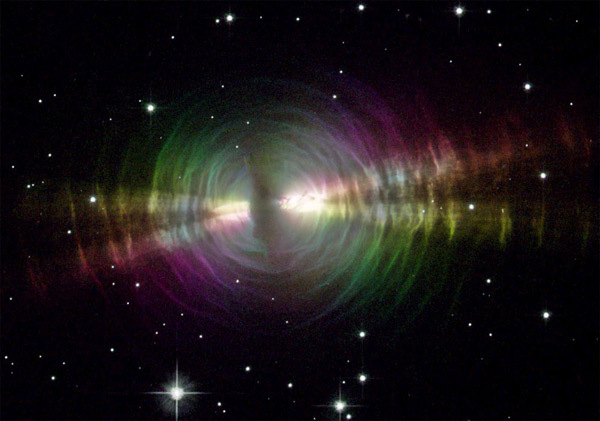 As the Egg Nebula this object is very strongly polarized, up to 60 percent but the polarization angle changes over the surface. This makes the observation very difficult. Nevertheless I believe I saw a changing brightness. 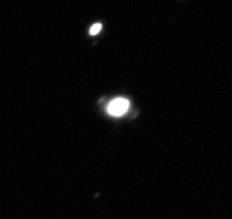 Right: CCD exposure of Frosty Leo, Wilfried Wacker, 16" Newton at f/4,5, WATEC camera, 50 x 10 Sec., the field of view is 2,5' x 2,5' wide. 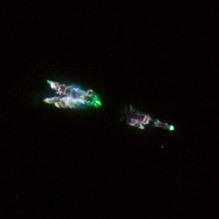 One more interesting object is the Westbrook Nebula. It was named after its discoverer Bill Westbrook. Deplorably Westbrook died with the age of only 26 years. The object consists of two 2" lobes in 6.4" distance . The interesting feature of this nebula is, that it a reflection nebula but also emission nebula. The emission here is again due to shock ionisation. The degree of ionisation is very low. Noteworthy is the high fraction of polarized light of 26 %. The distance is assumed to be 0.9 to 3.1 kpc, depending on the method used. The brightness increased from 18m4 in 1954 to 16m5 in 1975 according to . No data for more recent times is available. I could not see the object with my 10" telescope. 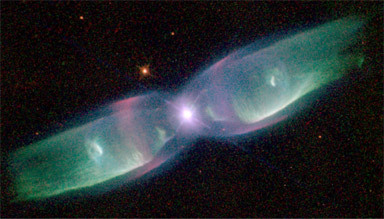 Famous manly because of spectacular views from the Hubble Space Telescope is the evolved proto-planetary M 2-9, also known as the Butterfly Nebula. According to  this object lies in a distance of 650 pc and it has a luminosity of about 500 suns. Taking this and the photometric brightness the central star should be of type B5. But such a central star would not be hot enough to explain the high degree of [OIII] emission observed. A way to explain this is a hotter but less luminous companion. Once again the high degree of polarized light of 60 % is notable! In my 10" the object quoted as 14m6 is a faint nebula, showing a slight response to the UHC filter. The north-south elongation is very clearly seen and the southern part appears brighter. The central star is also visible. I could not observe the polarization as the object darkened to much with the polarizing filter in front of the eyepiece. But observations with instruments from about 14" might be interesting. Hen 3-1475 is very interesting for professional astronomers primarily because of its, in visual wavelengths observable, up to 2300 km/s fast, collimated outflow (jet). Regrettably this object has not much to offer for the visual observer. It has a brightness of around 12 mag but remains stellar with all magnifications. It shows, as expected, no response to narrowband or polarizing filters. Eric Honeycutt could only assume a faint nebula even in his 22" telescope. Two objects which might be interesting for CCD observers are CW Leo and the Red Rectangle. In the visual band of spectrum CW Leo is a tiny star of 19th magnitude. If observed in the infrared it becomes one of the brightest stars in the sky! 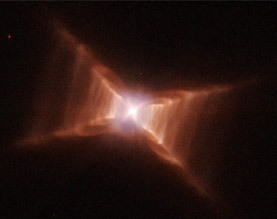 The Red Rectangle is a small X-shaped nebula around the 9mag star HD 44179. The shape is best seen in red light, for visual observers there is possibly nothing to see. 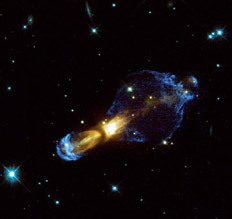 The Rotten Egg Nebula also named the Calabash Nebula lies close to NGC 2438 in the open star cluster M 46. The name has been given due to sulfur which was found with radio observations. 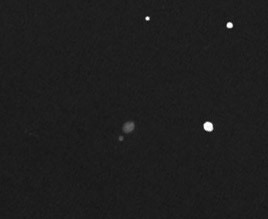 Michael Kerr succeeded to observe this faint object with his 25 inch telescope. Three more nebulae which might be visible with amateur telescope are the Silkworm Nebula, the Cotton Candy Nebula and Gomez's Hamburger. They have brightnesses of around 14m3, 13m1  and 14m4 respectively. All three lie in the southern Sagittarius milky way and are thus hard to catch for mid-Europeans. I could not see the Silkworm Nebula from the Alps (47� latitude) with my 10". IRAS 09371+1212 Frosty Leo 09h 39m 53.6s +11� 58' 54"
IRAS 17150-3224 Cotton Candy Nebula 17h 18m 20.0s -32� 27' 20"
IRAS 17441-2411 Silkworm Nebula 17h 47m 10.3s -24� 12' 54"
IRAS 18059-3211 Gomez's Hamburger 18h 09m 13.3s -32� 10' 48"